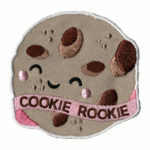 The Cookie Rookie patch from MakingFriends®.com looks good enough to eat! First time cookie sellers will love adding this to their vest. Troop and service unit cookie managers aren’t just ‘Cookie Moms’ any more! 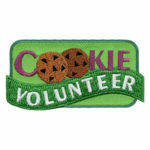 With more family members getting involved in the success of troops and cookie sales, the Cookie Volunteer patch from MakingFriends®.com is perfect. 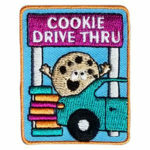 Remember to thank your volunteers with a cute patch. Your girls can reach more customers with a walkabout! Walkabouts can be done by one or more girls on their own with appropriate supervision, as a troop or it can even be set up as a service unit activity. A service unit walkabout would require some organization with troops being assigned different sections of town, but if all the troops are out on the same day it’s easier to spread the word to make the community aware. Walkabouts done by girls or as a troop have the flexibility to go around their neighborhoods when it’s convenient for them. 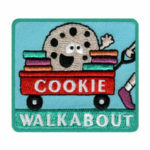 Either way, this adorable Cookie Walkabout patch from MakingFriends®.com is a great way to thank your scouts! When the girls come to a house with no one home, there is no need to loose out on the sale. Want Cookies? Door Hangers are a great way to let your neighbors know who to contact to get cookies! Have your girls set a goal for cookie season? 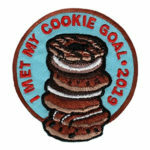 The I Met My Cookie Goal 2019 patch from MakingFriends®.com makes a nice reward for the girls that meet their goal this year. 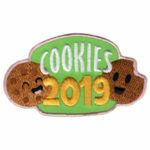 This cute Cookies 2019 embroidered patch is sure to please! 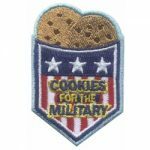 Talk to your cookie manager about how and why cookies are donated to the military. Your girls can help make people aware of the opportunity to donate cookies for the military with signs at booth sales and sharing information with their customers. 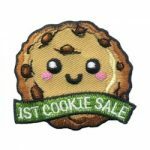 Once your girls understand and promote the military cookie campaign, reward them with a patch. Their first cookie sale is special. Mark the occasion with a cute patch. 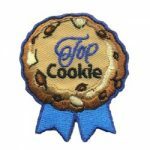 An extra special patch to thank your top seller this cookie season.